Kenzo Homme (Eau de Toilette Boisée) is a perfume by Kenzo for men and was released in 2009. The scent is woody-spicy. It was last marketed by LVMH. "In a land of myth, and a time of magic… the destiny of a great kingdom rests on the shoulders of a young boy. His name… Merlin." Today I'm rocking Kenzo Homme Boisee, a cologne that I am dealing with since its launch almost 10 years ago, but just today I decided to praise it with a review. The very first moment I've tried it I was captivated by it. So fresh and lively, yet cold in character. Unique, as Kenzo does make them that way. Do not be fooled by this one, fresh as it is, there is a great amount of thickness, heaviness, and woodiness. Notwithstanding its bottle shape and name, Kenzo Homme Boisee in no way is it linked to the original Pour Homme with the blue bamboo bottle. Honestly, I was expecting a melding of aquatic elements all layered over wood. The notes told a different story. The original fragrance is woody and nautical, with watery tones combined with floral sea spray, solar accord where sage is warmed up by the spicy accents of nutmeg and clove, all wrapped by oakmoss, vetiver and velvety sandalwood. 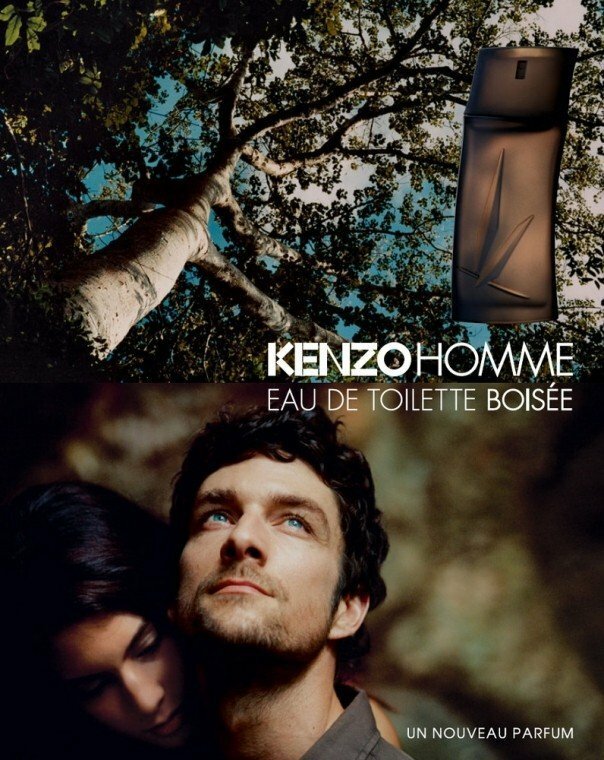 Instead, Kenzo Homme Boisée is a very aromatic, spicy, and woody fragrance, green, earthy, and mysterious. Think of the woods, crushed fresh basil, and mint, slightly grassy, with a touch of fresh pepper. The rosemary in the background. I smell a very creamy, clean, and fresh cedar at the base, with smooth vetiver allover. The mint is nothing that you will find in Live Jazz or Cartier Roadster, rather this is a very steamy and woody mint which prevented from getting too sweet, something more akin to Guerlain Homme l'Eau. It's a kind of rainy scent, the sensation to me is the same I have when I cross a forest after heavy rain and the sun start to shine again. It has a unique scent, much better than all mass appealing products available today on the market. Let's dive into this water. When it touches the skin it is minty, balsamic, and tangy. Vetiver will hit you from start to dry down. At first, the vetiver is accompanied by a pinch of tingling mint and leafy basil that give Kenzo Boisee enough dose of freshness. It starts off with that mojito accord of icy mint and lime, actually does smell like something in the realm of a mojito, and rather well done and pleasant too. The head is citrus and aromatic. This opening is brilliantly light and hints at an intensity that never becomes overpowering. If the top note is a soothing herbal composition, the heart has the warmth of pepper, while rosemary adds to the lusciousness. This freshness merges with a completely aromatic nuance, dotted by a touch of pepperiness. So, the heart notes are where the herbal character of the scent comes through, though, characterized by rosemary, and possibly other garden herbs too, certainly sage. The heart is spicy and woody. The rosemary interacting with the basil is especially nice and the pepper adds in a slight edge without becoming intrusive. The base is woody, with a greater presence of cedar with its clean pencil shaving, camphorated, and balsamic nuances. To me, it seems that the vetiver is rendered in its smooth form, very similar to Yves Rocher Cuir Vetiver. That phase is quickly gone and replaced by a more intense version of vetiver, a bit creamier, heavier. On dry down, the scent remains the same, but this time with cedar dancing in the background, pulling the vetiver into a more shy and earthy version, playing itself out to skin scent phase. Be careful, if you love vetiver, try it out. If you hate it, you won't find this appealing. The woods seem almost secondary to the spices from earlier but through the drydown, they really do the heavy lifting. The mint accompanied by the glorious vetiver shows their presence all the way through, so the perfume becomes rather linear but deliciously addictive. Sillage and longevity are also ok, less than Kenzo Power and Kenzo Pour Homme. During evolution, it can make you remember many other creations. In my case, I think of Guerlain Homme l'Eau, the mojito vibe is similar. A perfect fall scent, for office and leisure days. It is recommended as casual wear during daytime. Ultimately, Kenzo Homme Boisee’ is its own standalone fragrance, it is not as loud as "Kenzo Homme" and not as quiet as "Power". It has its own place in the middle, having a distinctive projection and a really good lasting power. This “woody” flanker of Kenzo Homme is one of those fragrances you can’t really go wrong with. It has for me a remarkable balance of generic safeness and decent quality, and above all, it is really pleasant to wear. You won’t keep sniffing your wrists and you won’t hear underwear garments fall at your side, but you’ll smell nice, fresh and effortlessly, discreetly classy. Plus this fragrance is also extremely simple and clean, which is another “added value” in terms of versatility and wearabilty. Basically on my skin it smells literally of three or four bold and clear notes: some citrus, an initial ton of sharp minty-aromatic leafy green (the fairly realistic basil-mint accord) which will then slowly fade away, a really tiny hint of some soapy musk and a really enjoyable vetiver base which will emerge more clearly on the drydown – which is basically nearly only vetiver and some musk again. The vetiver here is grassy, fresh and woody, nothing forcedly “dark” or inky/smoky. I’d dare to compare it with the marvelous grassy vetiver note in Guerlain Homme Intense, just with a lower quality (surprisingly not that lower though, it smells actually really compelling). That’s it: nothing groundbreaking or memorable, rather the epitome of clean versatile safeness – something solid (and it really is for me, quality-wise) you can generously overspray on the rush in every situation with every weather, when you’re not in the mood of wearing something more fulfilling or complex. Fragances sometimes are hard to describe, yet they create such clear lanscapes in your imagination... A stroll in a wooden deck, by river or a lake, at dusk; a sound: the tight knots of the humid rope that holds a rocking boat, the lament of the soaked wood under my naked feet, and last, the chill in the air, the waterdrops(is it morning dew or an evening rain) over the herbs and the leaves... I normally enjoy being on my own in my perfume worlds, but this time i wanted to bring someone with me, because it felt a bit melancholic. The opening of Kenzo Boisee is a refreshing splash of lemon, mint and a round irresistible basil. It is very high pitched citrus for a moment, but then it is mostly cold aromatic herbs. The freshness is enhanced with fresh cut grass and bamboo stems: a torrent of clorophile unleashed. Now there is a phase, before the proper woody stage, that is still aromatic green, but different... the bamboo allies with pepper: this is a very raw pepper, resinous, like taken fresh from the tree: aniseed, fennel-like as well as spice. The temperature of the fragances is still cool. The drydown of Kenzo Boisée is, as expected, wood: a beautiful loud cedar, hedione and an earthy, aqueous vetiver, so full, so round and vibrant that must contain Iso E Super, since i get the same vibe from Terre D´Hermes. Now it feels warm and enveloping. Kenzo Boisée has a great projection and reasonable longevity. Smells very clean and fresh, but doesnt have a dynamic spirit, is more introspective, romantic, grounded. I like Kenzo boisée so much that i gave it to the person i like more in the world. Luckily, my beloved liked it as much as i do, so i made two people happy at the same time. Write the first Review for Kenzo Homme (Eau de Toilette Boisée)!